Discover why Adelaide in Australia ranked #60 in our countdown of ‘100 Most Incredible Cities in the World’. Known as the ‘City of Churches’, Adelaide is adopting a more energetic personality. The festival calendar is growing, live-music is in demand and hipster bars are tucked away in laneways, slowly but surely outnumbering the spires. 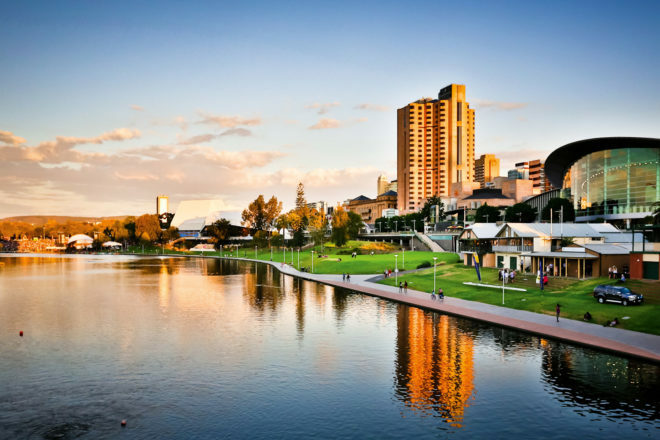 The South Australian capital has been causing something of a stir of late, at an international level. Last year it was declared one of the top 10 cities in the world by Lonely Planet, coming in ninth. This is thanks in part to its transformation into a food capital. There are at least 40 food trucks cruising around serving everything from Moroccan to vegetarian and select local cheeses; you don’t even have to set foot in the host of new restaurants springing up on Peel Street. To cap it all is Adelaide Central Market, a huge space where over 80 vendors sell produce from the nearby Barossa Valley and Adelaide Hills. For more travel advice, dreamy inspiration and brag-worthy holiday ideas in Adelaide, visit our sister magazine, Australian Traveller.